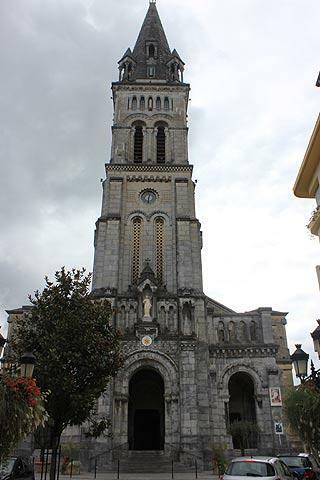 Lourdes is a town in the Hautes-Pyrenees department, 45 kilometres south-east of Pau. I hardly need explain the attraction of Lourdes. In 1858 in a cave near the town - the Grotte de Massabielle - the Virgin Mary appeared several times to a local girl, Bernadette. From this beginning a substantial pilgrimage destination has arisen, a substantial industry has flourished based on these pilgrims, and many millions of visitors descend on the town each year. 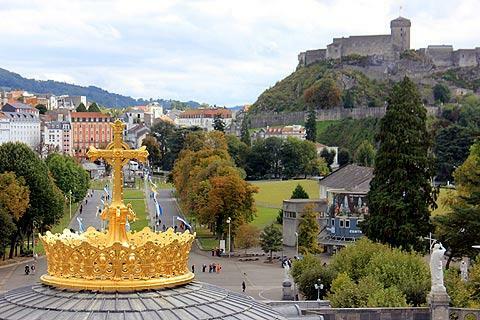 Lourdes is one of France's leading tourist resorts, and with over 220 hotels it boasts the largest number of hotels of any town in France outside of Paris, occupied by a massive 5 million visitors each year. France This Way comment: the descriptions of a visit to Lourdes below are a combination of contributions from more than one visitor, so you can see that Lourdes has a different impact on different people. 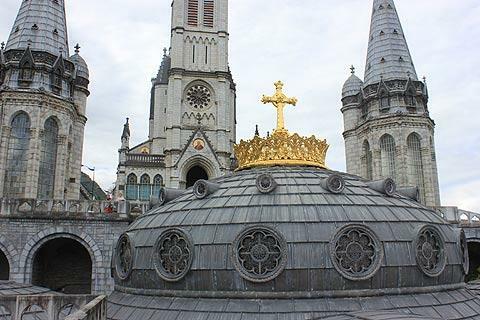 To many visitors it is a town offering a glimmer of hope, while to others Lourdes is simply a crowded resort. 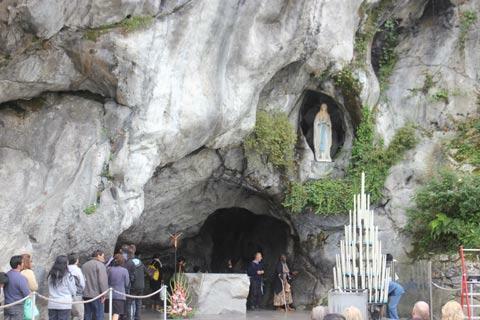 In truth of course it is both - the sanctuary and grotte area of Lourdes is a calm, restful environment where the faithful gather, while the town outside the sanctuary is crowded with tacky gift shops and cheap restaurants. If you can enjoy one and ignore the other a visit can be very pleasant! 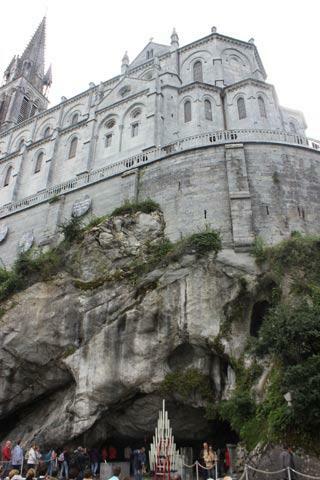 This part of Lourdes, with the church, chapel, crypt and grotte, is across the bridge from the town centre and surrounded by quite extensive gardens. The buildings themselves are attractive enough, mostly dating from the late 19th century. 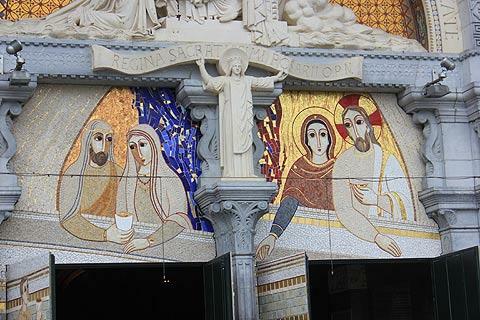 The Basilica of Saint Pius X is the largest of churches, able to accommodate over 25,000 people. It’s an awe inspiring place and a 'must see' on your places to visit. The grotte where Bernadette appeared is just below the basilica towards the river and now contains a statue of the saint. There are also places where you can drink water from the spring. Also within the sanctuary area (just beyond the grotte) is an extensive 'candle burning' area. 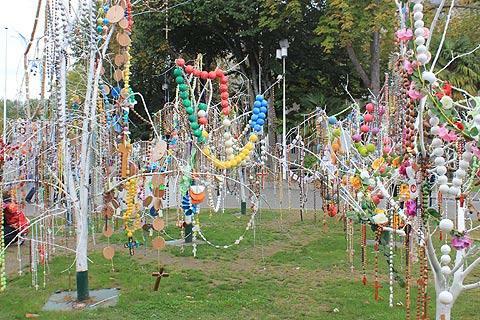 To the front of the basilica there are several trees hung with rosaries left by visitors - these get sent around the world to related Christian communities at the end of each year. 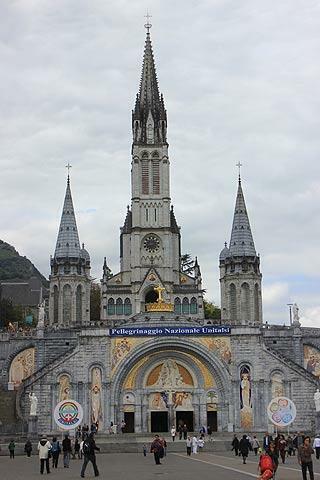 For visitors looking for a spiritual experience there are masses offered in over 22 languages, at all times of the day and night: the tourist office in Lourdes will give you all the information you need. For the curious or those seeking a cure it is a good idea to get the program of masses, or like me you’ll walk in at a crucial moment with children running amok and heads will turn, as you rapidly seek your excuses in any language before sneaking out tail between legs. 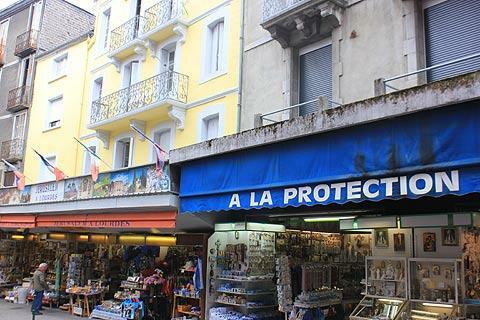 With countless churches burning over 750 tonnes of candles each year, nine museums and far too many souvenir shops, Lourdes tries to combine an important historical value with a great deal of plastic tat. When Bernadette Soubirous had her Apparitions, very little thought was given to the fact that this beautiful valley town, would be impregnated by concrete over-development, and less thought was given to the fact that the sick and wounded would end up visiting this place as their last resort… as the narrow pavements, and steep hills aren’t overly conducive to wheelchair travel. 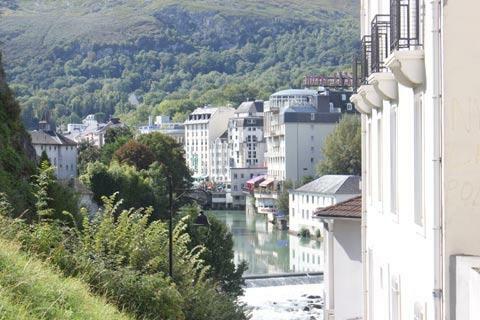 In the town of Lourdes itself you can see the house where Bernadette was born and also the house where her father lived. These are among the most interesting houses in the town. Slightly tacky, but a handy way to get around is by using the tourist train. This covers 7.5 kilometres and the trip lasts about 45 minutes: it offers you the chance to see the Cité Mariale, the old quarters, the upper town and its historic buildings. You can hop on and off the train at various intervals throughout the journey, but if driving through by car, beware, the driver gets irate if you get in his way. A walk up towards the forest and you’ll see where Bernadette gathered dead wood in her pre-apparition days: there are a wide range of marked walks with information, children’s play areas, an exercise course and even a picnic area. Le Pic du Jer has a large cross and can be accessed by the chair lift reaching the summit which is approx 1,000 metres high in only 6 minutes. The ascent is stunning, taking you through the pine trees and offering magnificent views over Lourdes, Pau, Tarbes and of course… the Pyrenees. It’s well worth a trip. 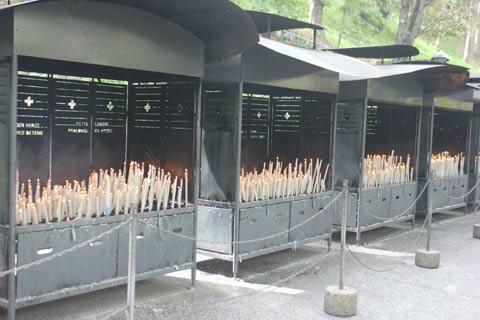 All in all… Lourdes is a place to say you’ve visited, there is something for everyone, but the commercialisation spoils the spiritual meaning, if it’s a spiritual place you’re looking for, then you’ll find soul in the Ardeche. 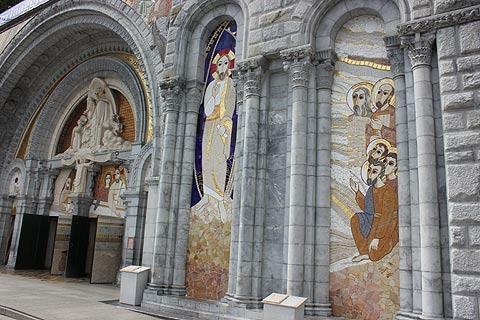 Set in the stunning backdrop of the Pyrenees there are many reasons to visit Lourdes, if not for just for the holy benefits then certainly for the astounding scenery and endless activities here and amazing excursions in to the Pyrenees. Only minutes from the town centre is an amazing lake, formed from a glacier, it’s one of the largest in the Pyrenees spanning over 55 hectares. 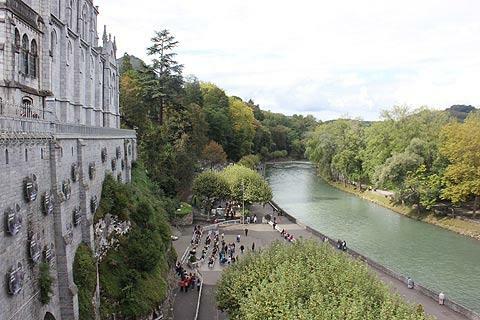 You can also escape from the hassle of Lourdes with an array of fishing and water sports including sailing, rowing, pedalos, mountain-biking, horse riding, and Lourdes is a fabulous spot to picnic with many “tourist orientated” restaurants which are best avoided as they charge tourist prices too! The south bank of the lake also offers an 18 hole golf – course. For historical value, a trip to the Mauvezin Castle (a medieval fortress) built between the 11th and 14th centuries by the counts of Bigorre and completed by Gaston Fébus and Jean de Grailly is well worth your time. The castle is a great place to visit for those with children With a magnificent views you’ll see the Pic du Midi, and enjoy an amazing view of the Pyrenees along with the 37-metre-high keep houses. There’s also an archaeological museum, with various exhibitions, a gun room and reconstructions of historical scenes.